Film Portret on the Laureate Piek Vossen, September 27, 2013. ‘behind the scenes’ video NWO Spinoza laureate Vossen, June 10, 2013. Vossen on Poster in VU-building as one of the 11 Topscientists of the VU: Campustentoonstelling VU Amsterdam, September 2012 – April 2013 (see video and read interview). 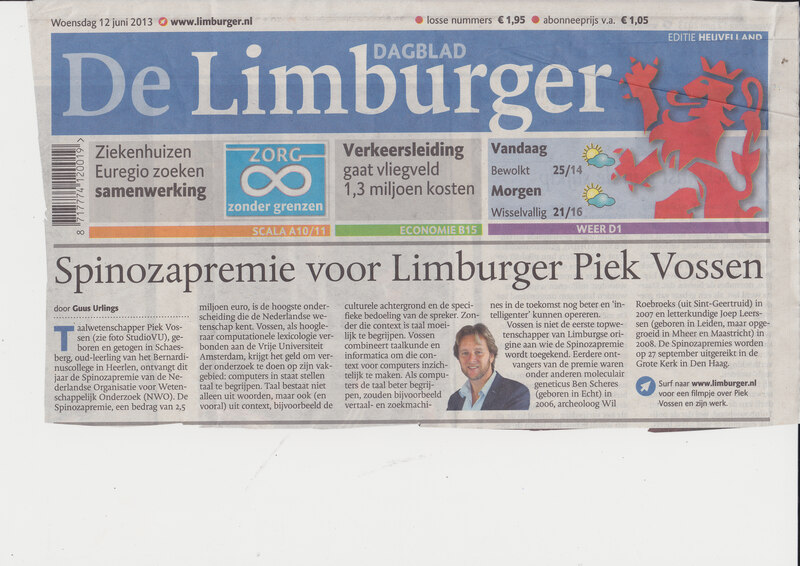 Press release VU University Amsterdam on NewsReader project, February 5, 2012. Vossen: interview regional Dutch radio MediaMix, Den Haag FM on lecture on NewsReader in Museon, February 2, 2014. Vossen: “Digital Humanities: Hype or Revolution – Part 3: ”Het gezicht van de sociale media“ at Spui25, Amsterdam, the Netherlands, February 6, 2014 (see video). Vossen: invited participant in Nationale Wetenschapsquiz, VPRO Dutch national television (see show), December 29, 2013. Vossen video on “Digital Humanities: Hype or Revolution – Part 1 ”De digitale kaart van Landschap, Architectuur en Verstedelijking“ at Spui25, Amsterdam, the Netherlands, December 12, 2013. Vossen video-interview, Fast Moving Targets, Amsterdam, the Netherlands, November 12, 2013. Vossen in theatershow on Digital Humanities at ”Gala van de Amsterdamse Wetenschap“, in cooperation with Parool and Folia, Stadsschouwburg, Amsterdam, the Netherlands, November 26, 2013. Vossen interview @Dutch radio show “OBA Live” with Theodor Holman, Openbare Bibliotheek (OBA), Amsterdam, the Netherlands, October 11, 2013. Vossen Dutch national radio interview @BNR Newsradio, September 27, 2013. Vossen interview @”Dit is de Dag“, Dutch radioshow Radio 1, Hilversum, the Netherlands, July 23, 2013. Vossen interview @L1 Dutch radioshow De Stemming, café Forum, Maastricht, the Netherlands, June 30, 2013. Vossen national Dutch radio interview NOS Nieuws, Radio 1, June 10, 2013. Vossen national Dutch radio interview NTR Hoe?Zo! Radio, June 10, 2013. Vossen interview @Dutch radio interview on new EU-project NewsReader, in Radio Station FunX, Amsterdam, May 10, 2012. Vossen interview national Dutch newspaper Parool, June 11, 2013. 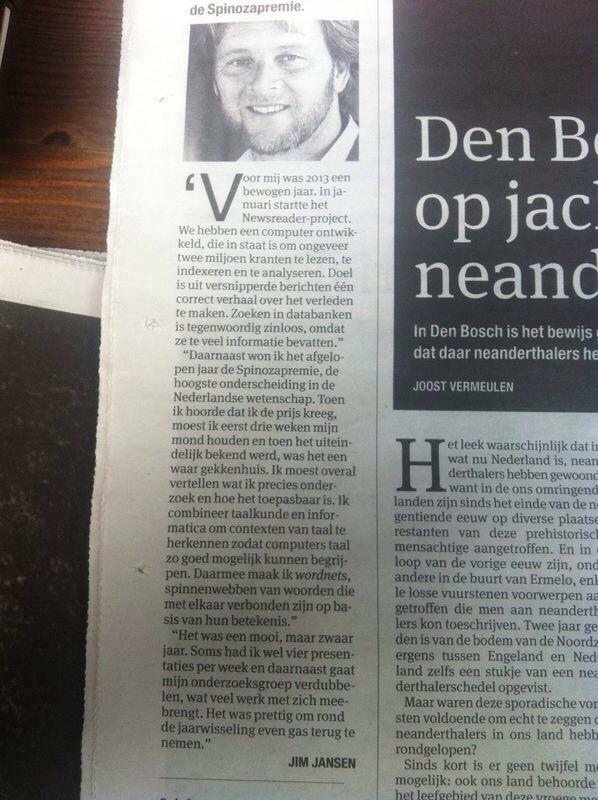 Vossen interview national Dutch newspaper Volkskrant, June 11, 2013. Vossen interview national Dutch newspaper Trouw, June 11, 2013. Vossen Interview national Dutch newspaper Algemeen Dagblad, June 11, 2013. Vossen interview national Dutch newspaper NRC Handelsblad, June 11, 2013. Vossen interview national Dutch newspaper NRC Next, June 11, 2013.
press release national Dutch newspaper Volkskrant, June 10, 2013.
press release national Dutch newspaper NRC Handelsblad, June 10, 2013.
press release regional Dutch newspaper De Limburger, June 11, 2013.
regional Dutch newspaper Limburgs Dagblad, June 11, 2013.
press release regional Dutch newspaper Weesper Nieuws, June 11, 2013.
press release regional Dutch newspaper Gooi- en Eemlander, June 12, 2013. 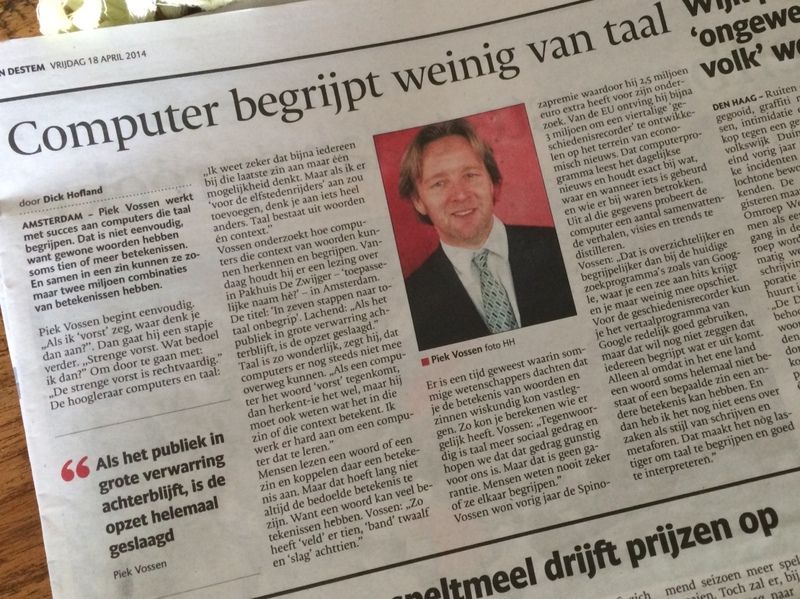 Interview “A computer that really understands language”, by Netherlands eScience Center, 2015. Vossen interview Kennislink, June 10, 2013. Vossen interview Ad Valvas, June 11, 2013.
article in Computable, June 12, 2013. Announcement Olery, June 12, 2013. Announcement in Elsevier, June 15, 2013. Announcement Onze Taal, June 11, 2013. Announcement Network Institute, June 10, 2013. Announcement eScience Center, June 10, 2013.